Managing network remotely is not always an easy job for administrators, especially when working on networks scattered across multiple sites or even countries. The Zyxel Cloud Network Center (CNC) is a public cloud network management system that enables users to check the health status of single or multiple networks anytime, anywhere. The Web-based interface requires no extra management application to install or maintain, and it allows management of switches, access points and gateways performed through a single platform. You can use CNC to manage your network with scalable license plans to fulfill actual needs. What’s more: the one-click restore feature of CNC enables faulty devices to be easily swapped out even by non-IT personnel while deploying one Cloud Network Agent (CNA) for one site. With Cloud Network Agent (CNA) deployed on customer networks, the Zyxel CNC is able to collect the operating status of network devices as well as to manage customer networks through CNA. In addition, the CNA supports SNMPv3 that can be configured through the CNC to provide more secured data encryption and access authentication as the managed nodes are in public networks. The CNA has DHCP enabled by default and NAT pass-through by nature to make zero-touch deployment possible. The Zyxel CNC has secure remote GUI, and even CLI, accessibility to devices such as switches, access points and gateways to facilitate configuration and troubleshooting. With the VPN tunnels existing among VAR/MSP and customers, Zyxel’s CNC elevates services to become a platform with only a single CNA deployed on the administrator site but is capable of managing multiple networks. The CNA collects operating status from SNMP enabled devices scattered on multiple sites. 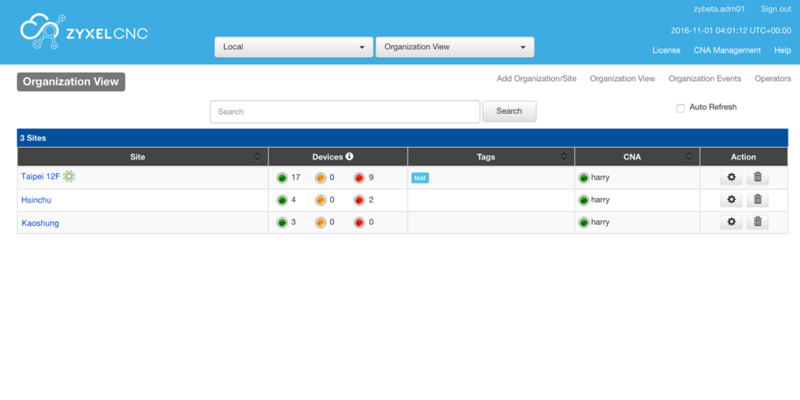 It’s now easier than ever to manage networks on multiple sites and to monitor their on/off status. The main screen of the Zyxel CNC MSP Portal provides a quick view of network health status of multiple organizations, which enables administrators to drill down to the organization view to see the number and status of devices on each site as well as to find the on/off status and more for each device in the site view. 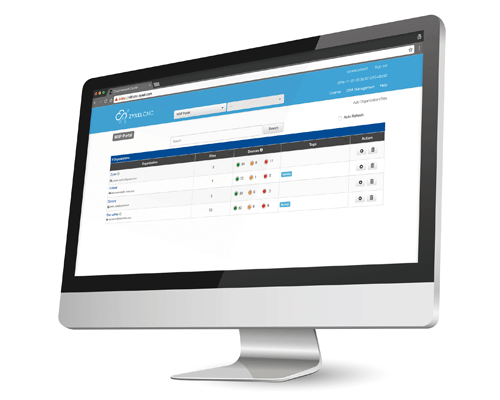 Additionally, the Zyxel CNC allows multiple administrators to manage customer networks with different privileges for easier management with more flexibility. Should a failed device is found on a remote site, it is not easy to have a local IT expert or to send one there. 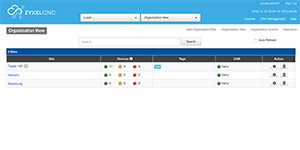 In one-site CNA architecture, the one-click restore feature enables non-IT personnel to just plug a new replacement into the CNA, and then take advantage of the feature to let it configure itself. The whole process can be performed remotely, easily and efficiently. Zyxel’s CNC provides scheduled configuration backup and firmware upgrade to avoid network interruption. With the new attentive firmware notification, you can schedule firmware upgrades as soon as new ones are released. You can also simplify configuration by issuing commands to the selected devices to significantly reduce time spent on deploying networks. Also, Zyxel’s CNC can detect the health status of networks and devices periodically, and send alert emails to administrators should any abnormality occur. 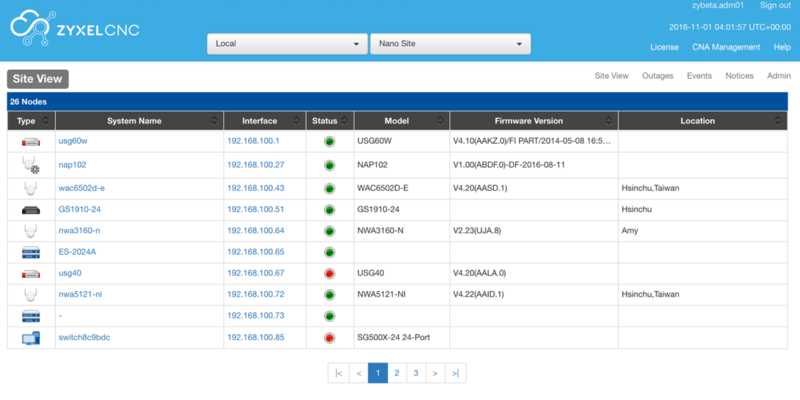 Zyxel CNC provides a scalable, flexible way to manage your networks via CNA and licenses. There are three tier-node (50/100/250) license types that can be purchased based on the amount of devices you manage. 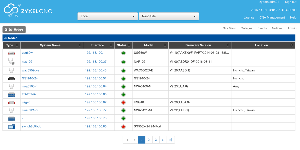 For example, the 1-year-50-node license allows you to manage 50 SNMP enabled devices for one year. The license calculator assists you to check the usage as well as to register and activate licenses. With Cloud Network Agent (CNA) deployed on customer networks, the Zyxel CNC is able to collect the operating status of network devices as well as to manage customer networks through CNA with secure encryption. The CNA has DHCP enabled by default and NAT pass-through by nature to make zero-touch deployment possible. 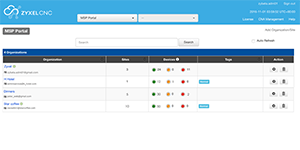 Manage networks on multiple sites and to monitor their on/off status, as well as the health of networking devices from switches, access points to gateways only with single platform. Download the Zyxel Cloud Network Center Datasheet (PDF).